As I was doing my morning reading, this wonderful short article came across my desk from The Atlantic. I am usually not one to share thoughts about articles I have read, but seeing as most readers who come read The Workette are fashion oriented, you would enjoy it. What made Zara's Big Idea: What the World's Top Fashion Retailer Tells Us About Innovation so interesting to me is that I never thought about how they really don't do any advertising at all. And everyone seems to think it's a luxury brand when it is only half a step above stores like H&M. Only the other day I noticed that Zara had an official Facebook page. 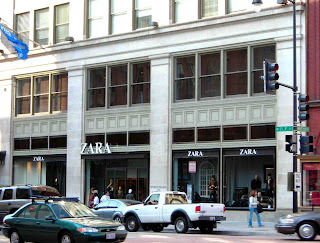 And, when I was in Paris last year, Zara was closely placed near the likes of Louis Vuitton and Gucci. This article got me thinking, when I was in University people would always think Zara was a big deal, I thought it was because of the prices but, I guess now its because of the mind games of the Zara strategists. The article really made me think, and I think it's quite true. I've never realized, that they don't do any advertisment. And I admit that I usually love(d) their stuff, but since the last year or so, I have only occasionally bought something at zara, because the price-quality-relation isn't really okay for me. Most of the current stuff is so overpriced and doesn't last (look good) any longer than one season, whereas I have some old thing of Zara that I've been wearing for years now. I really prefer other brands/shops, but Zara does ineed something young women adore: they bring out so many new clothes every week, that you simply have to look for the new stuff. And I still like quite some of their things, I just keep telling myself that I won't be happy for long with it. I have noticed that too! its almost becoming too trendy, but they sure do have some timeless pieces! its pretty big in Europe and on the east coast! Wow I never though about how they never advertise. I find Zara appealing because they have knock-offs that are SO similar to the original versions! yes! me either it was a "eureka" type o article when i stumbles upon it! Not sure who thinks that Zara is a luxury brand? I think that they make very affordable clothes. If I wear some of their clothes only a couple of times I don't have to feel guilty about it. When I was in college, I wrote a paper on Zara's success due to their just in time inventory system!! They are definitely creative geniuses, but they're also marketing and manufacturing geniuses too!! Thank you for your kind comment on my blog. This is such a wonderful point and a persepctive that I had not really considered before. I personally think Zara's strategy is brillant, they have successfully made people connotate their name and brand with luxury without spending a dime on marketing. Instead they have spent money on securing premium locations adjacent to or in close proximity to the high end brands. I look forward to following your blog. Thank you again for the comment.